Does *|District|* need local ed tech info? We've got you covered! Cohort 7 of the Master of Arts in Education in Educational Technology (EdTechMA) starts this fall. The EdTechMA program prepares cutting edge teachers, technology coordinators, and software developers to implement current technology tools in education, and to evaluate future technologies as they emerge. The program is targeted for school teachers, but often includes professionals from higher education and industry as well. Courses on technology in the classroom including: educational multimedia, interactive software for learning, educational websites, assessing the impact in the classroom and integrating technology into Science, Math, English and Social Studies classes. How are you fundraising for things you need in your school or classroom? If you have an interesting project, we'd love to feature it here! 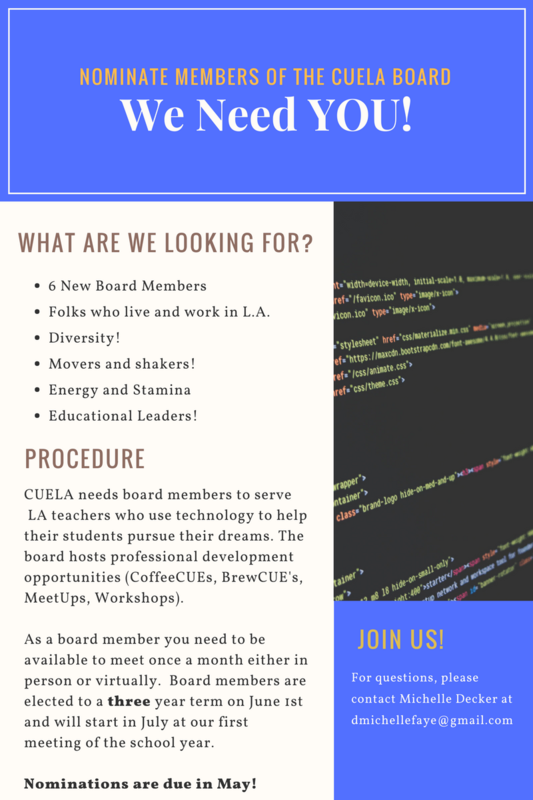 Email board@cue-losangeles.org if you'd like to be featured. The AV EdTech Summit will be held on Saturday, May 6th at Highland High School. The main keynote speaker will be Dr. Milton Chen. Dr. Chen wrote the book, Education Nation, was a director of research for Sesame Street, The Electric Company, and 3,2,1 Contact. He currently serves as an Executive Director for the George Lucas Education Foundation. Teachers and other education professionals can attend for $25 per person. This includes breakfast, lunch and a full day of professional development - A GREAT DEAL! This two-day professional development event, which is held at the Windward School in West Los Angeles, is designed for all teachers, administrators, and informal educators - the event is catered towards educators from all disciplines, levels of experience, and learning environments from informal to classroom. Participants will get hands-on training and experience with design techniques, traditional tools and materials of making from experts in the area, and hear from cutting-edge practitioners about what is possible in the world of Design and Making in both general and specific ways. Learn more and register here.